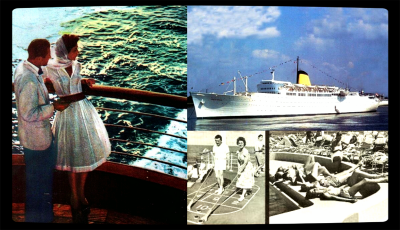 Home / 1950s / The elegant MS VICTORIA cruised out of New York. 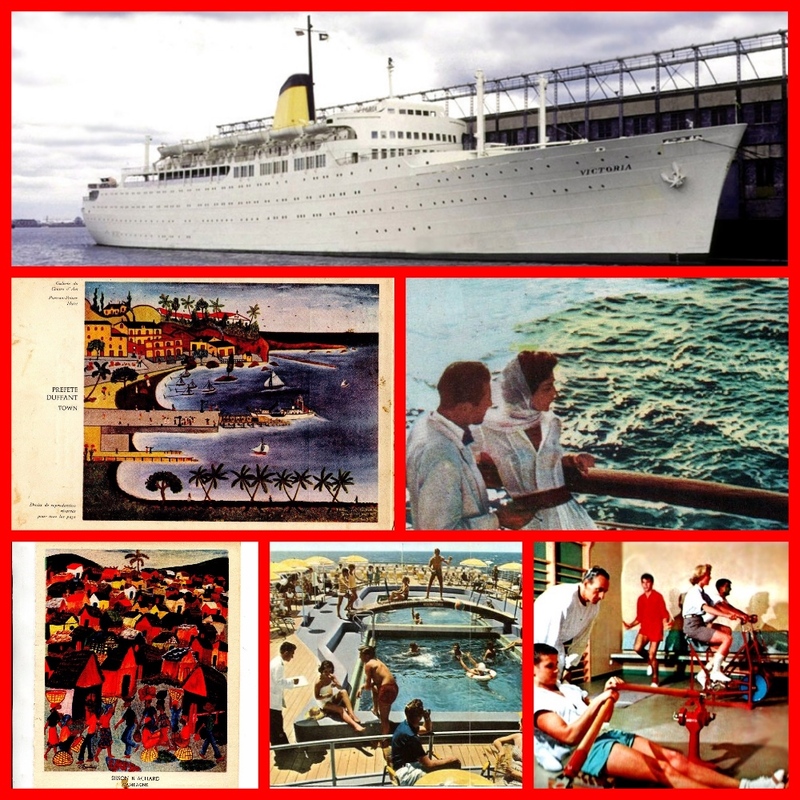 Enjoying a long and colorful history, Incres Line’s MS VICTORIA offered Caribbean and Mediterranean cruises with first class service to 600 passengers. The VICTORIA was built by Harland and Wolff of Belfast in 1936 for Union-Castle Line as the DUNNOTTAR CASTLE for the company’s round Africa service from London. She operated as a passenger-cargo liner into the early 1950s, except for her services in World War 2. In 1958, she sold to Incres Lines who were seeking a solidly constructed ship to rebuild into the ultimate luxury cruise liner. 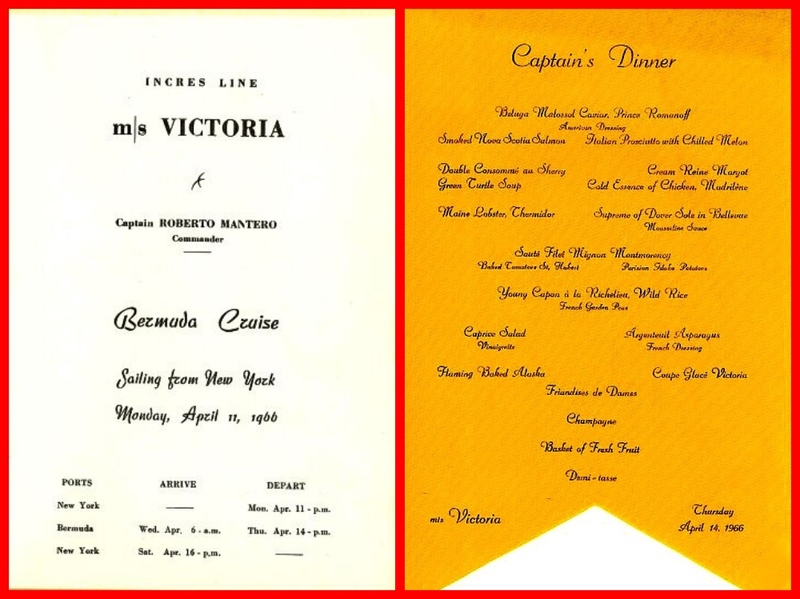 The VICTORIA in New York, Menu Covers, and life onboard. A complete rebuilding was performed, transforming her into the sleek, deluxe 600 first class passenger VICTORIA. The all-Italian officers and crew provided excellent service. 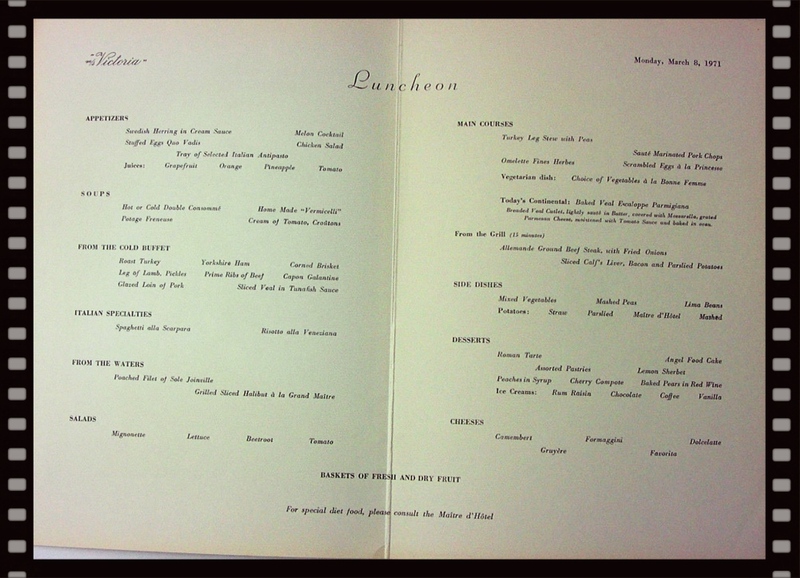 Gourmet cuisine was the norm on the VICTORIA. Completed in December 1959, the VICTORIA having undertaken her deep-sea trails which proved that she was capable of a good 21 knots, she was delivered to her owners and she undertook her first Mediterranean cruise on December 14, which was followed by a European cruise. She then departed on January 14, 1959, on a crossing from Rotterdam to Southampton from where she undertook her maiden Mediterranean cruise. Upon her return, she departed Southampton on January 8, 1960, and sailed on a positioning voyage to New York, but made a call at Le Havre on the way. All cabins had private facilities, either with a bath with an overhead shower, or a shower. In addition, each Suite, Stateroom, and cabins had individually controlled air-conditioning, which was a new feature for the day, but also every room had Private Facilities, with either a bath or a shower! The VICTORIA, Dining Room, Ballroom and deck plan. 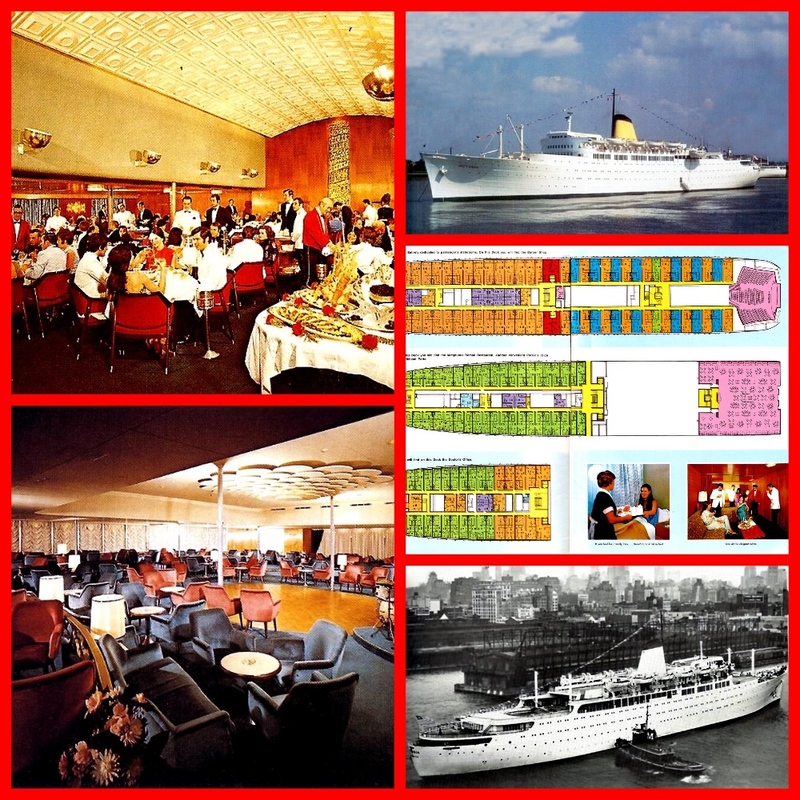 Her superb décor was created by leading Italian designer Gustavo Pulitzer who gave the MS Victoria a whole new quality and style for a modern cruise ship in the early sixties. She was regarded as one of the most beautiful and spacious cruise ships of her day, as she accommodated just 600 First-Class passengers in the ultimate of luxury! 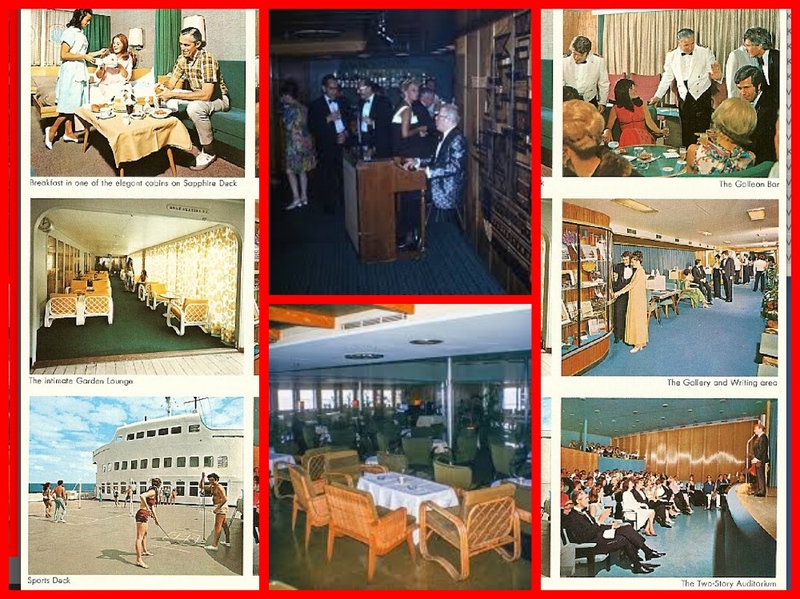 All her lounges were simply stunning for it was the famed Italian designer Mr. Gustavo Pulitzer who created a new style of a cruise ship for that time, and she was very special. 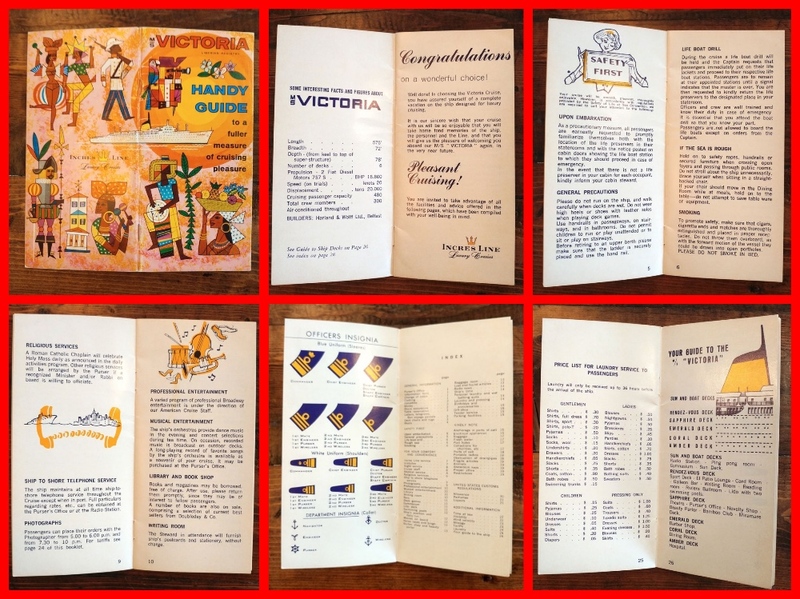 VICTORIA cruise booklet and Captain Dinner Menu. On Coral Deck was the superbly domed Roman Restaurant and this was one of the grandest venues aboard. It had a bandstand located on the aft wall high up, and the venue was superbly timbered. This grand venue offered special lighting features that gave the Roman Restaurant that spectacular style and lighting could be changed to fit the mood of the event and the meal! The forward timber wall had a huge ceramic sculpture that soared high up the two levels. Her decks were named after precious and semi-precious jewels and color coordinated accordingly. On Amber Deck, one would find amber colored banisters and carpeting. Same for Coral, Sapphire, and Emerald, etc. VICTORIA had a dining room with a barrel-shaped domed ceiling and musician’s balcony as well as a two-deck-high theatre. Emanuele Luzzati created most of the artworks, which were based on Roman themes and in media ranging from metallic panels to elaborate ceramics. Like many other cruise ships, VICTORIA was a victim of the fuel crisis and high operating costs. 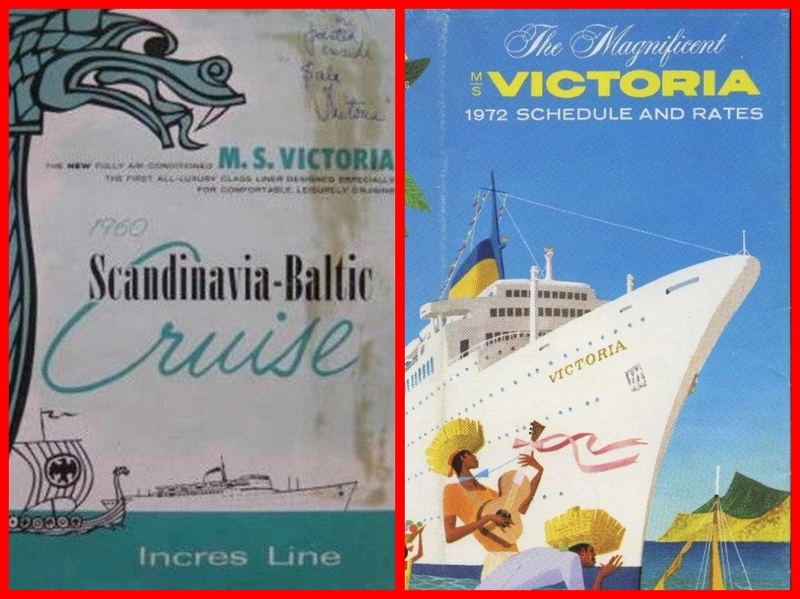 Incres Line went out of business 1975, and the VICTORIA was sold to Chandris Cruises. Next: In the 1950s SUDDEN FEAR film star Joan Crawford heads to San Francisco on the famed California Zephyr.